Piano manufacturer, of Store Street, London. Credited with advances in the development of the tape check action; patented by him in 1826 and still used in upright pianos to this day. Some of his pianos still survive, most of them being of the popular “Cottage Upright” or “Piccolo” model but as they are very old and have wooden frames they are almost impossible to keep tuned. There was a fine example of a grand piano made by him displayed in the Musical Instruments collection at the Victoria and Albert Museum in London. In 2010 this gallery was closed because the V&A considered that expanding their display of dresses and costumes was more important than retaining their display of historical musical instruments. If anyone has one of his “Albion Square” pianos I would be especially interested to hear about it so please contact me using the form on the home page. He married Catherine Nicholson in 1810 and they had nine children, their eldest son was Ralph Nicholson Wornum (1812-1877) who was treated by his father to many years of study and travel. Their youngest son, Conrad Nicholson Wornum (1821-1902) was a Pharmacist who emigrated to Australia in 1850 and many of his descendants live there now. There is an entry on Wikipedia, which includes a portrait alleged to be of RW. One can only assume he was much older then, as it looks nothing like the above portrait that has been in the Wornum family for many years. 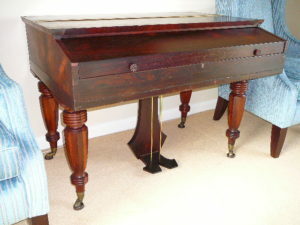 And below is a “Cottage Upright”, or “Piccolo” piano. I will try to get a better picture of this model!